The location was great for us and the size of the villa was fantastic for 8 people . Erik the host was brilliant and looked after us and gave us very clear and accurate information about the villa and what to do around the area. Our 4 day stay was really wonderful, as the villa has the most amazing view from every terrace. It is really wonderful to wake up to that view, you don’t even want to leave the house. 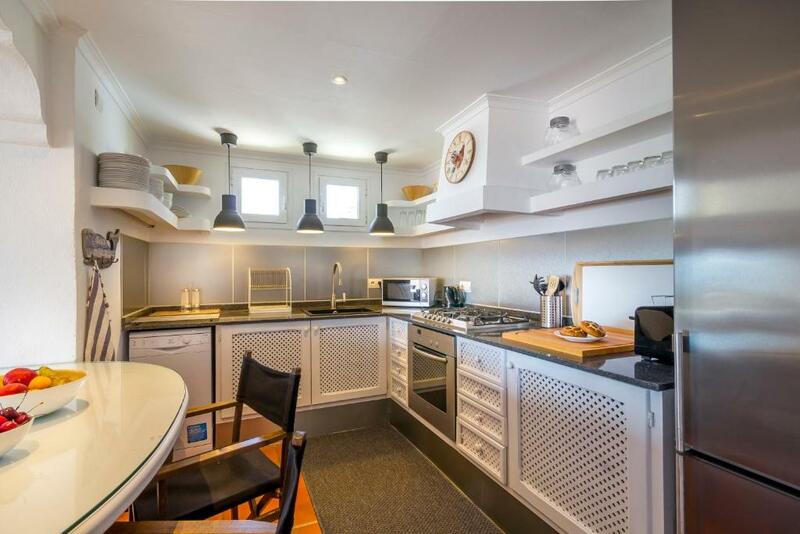 The kitchen was fully equipped with absolutely everything, so if you do your own cooking you don’t need too. 😅 Erik was really helpful and explained everything. We’ll be back ASAP! Layout of property and nice views, host very helpful and keen to help with anything. Recommended a very good vegetarian restaurant for us in Ibiza town. Erik our host was extremely accommodating helping us to check in early and spend longer by the pool before we left. The views are incredible and the balconies were great to spend the evening on. Also useful that basic items are available washing up liquid, cooking oil etc. Saves each guest buying new each time. Brand-new very nice Villa located on Talamanca hill (ca. 5 min drive to Ibiza down town). The location was amazing and quiet. The Landlord was very nice and helpful. A very pleasant stay! The villa was of an excellent quality. Everything had been thought of. El trato de Erik para hacernos la estancia desde el momento del checking hasta el check-out lo mejor posible; la disponibilidad absoluta a resolver cualquier situación y su flexibilidad para ayudarnos en todo momento. Las recomendaciones fueron constantes para sacar el máximo partido a nuestra estancia; la casa dispone de todo tipo de comodidades y los baños son todos individuales y de uso exclusivo para cada habitación; las áreas comunes son muy amplias. Una casa meravigliosa e pulitissima. Ogni confort presente, letti comodissimi e cucina super attrezzata. Presente anche stanza lavanderia. Molto ampia. Le foto non rendono giustizia alla vera bellezza. Lock in a great price for Can Panorama – rated 9.7 by recent guests! Featuring stunning sea views and free WiFi throughout the property, Can Panorama is a holiday home, set in Talamanca. 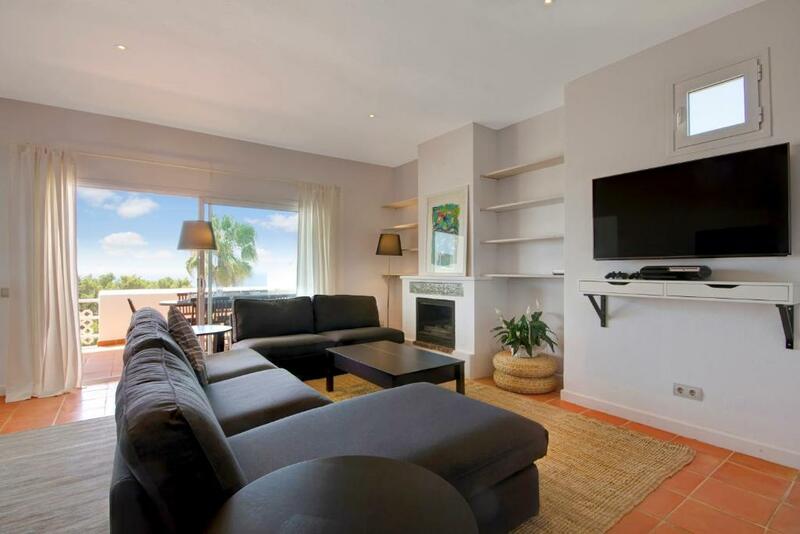 Offering free private parking, the holiday home is 1 mi from Talamanca Beach. The property features 4 bedrooms with bathrooms, a well-equipped kitchen, a living room, 3 terraces and a garden. this bright house also comes with air conditioning, TV and free access to Netflix. A fully-equipped kitchen is also featured, including oven, microwave, dishwasher, kettle, electric juicer and cookware. Ibiza city center is 2.5 mi away from the property. 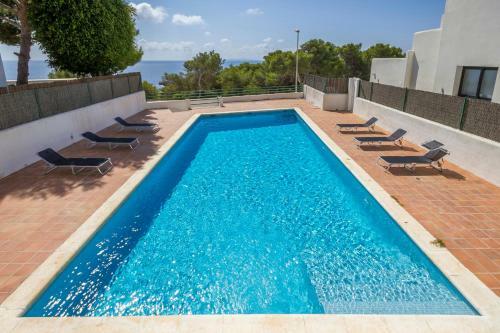 The nearest airport is Ibiza Airport, 6.2 mi from Can Panorama. 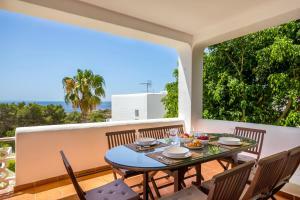 This property also has one of the top-rated locations in Talamanca! Guests are happier about it compared to other properties in the area. 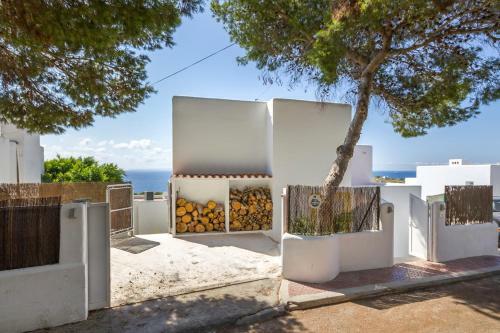 This property is also rated for the best value in Talamanca! Guests are getting more for their money when compared to other properties in this city. When would you like to stay at Can Panorama? This holiday home features 4 bedrooms with 4 complete bathrooms. 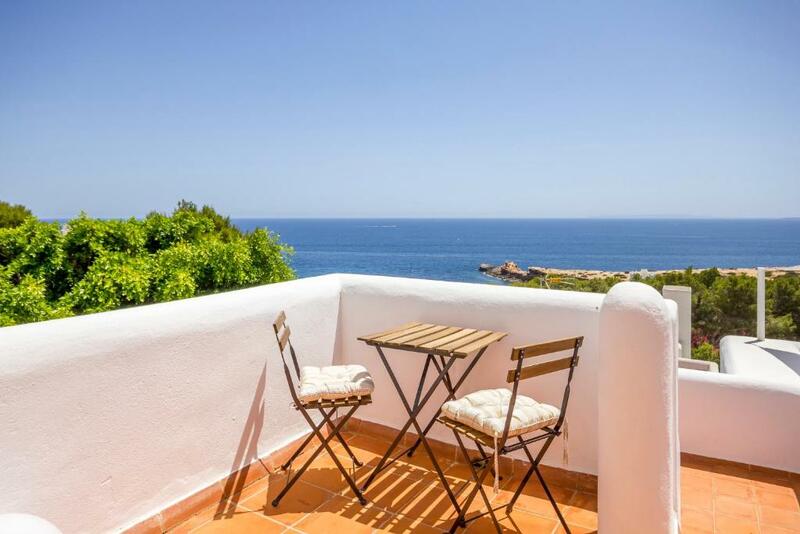 2 bedrooms have direct access to a private terrace with views. The home also features a living room with comfortable and large sofas and a TV with Netflix free access. Attractions : views, beach, family activities, gastronomy and nightlife. 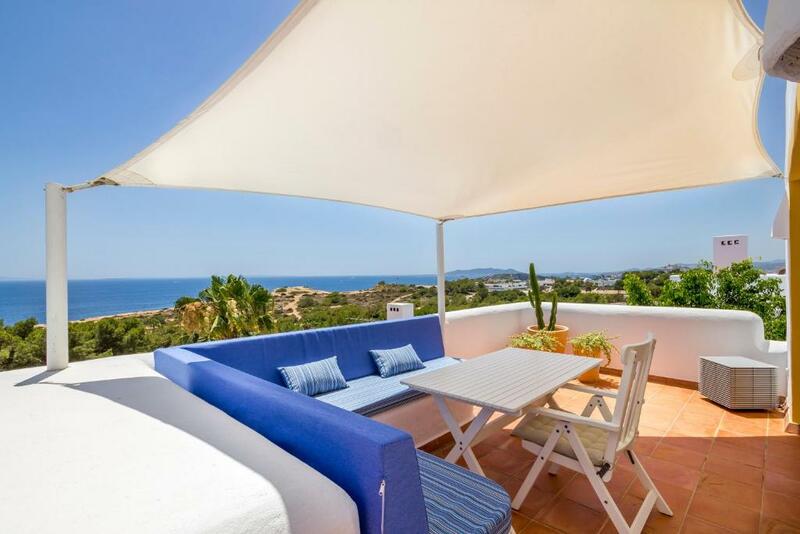 You 'll love my place because of the spectacular views, the outdoor areas, brightness and its strategic location; near Ibiza Town (old town seen from one of the terraces), Destino, Pacha, Talamanca and s'Estanyol beaches... but enough distance to enjoy absolute tranquility. Four rooms with complete private toilet in all of them, a well equipped kitchen, a comfortable living room, three terraces and a well kept garden will offer maximum comfort. House is equipped with Air Conditioning, TV's, Optical fiber WiFi,... My accommodation is suitable for couples , adventurers, families ( with children), and groups of friends. If tired of moving around, and looking forward to relax on the sofa, free access to Netflix is available with the UHD living room TV. Just like a cinema at home. I'm from Barcelona but have yearly visited this island since my 5 years old. During this time I've enjoyed its parties, people and beaches and now, passed my 40's, I enjoy the island in a more relaxed way, specially, its delicious gastronomy which I hope you will taste. At time being I spend most of my time here enjoying, not only summer season, but also the charm of the Spring and sweet nostalgia of Autumn. I'll be very happy to host you and help in anything that will make your stay unforgettable. House is located in a privileged point, from where you'll arrive to the city of Ibiza in few minutes but also keeps you away from the bustle. Nearby you have beautiful beaches and popular establishments like Destino and Pacha . The centered position of the house on the island allows to discover east, west, south and north without more kilometers than those strictly necessary. If you want to visit Formentera, the departure point of the ferries is also very close. House Rules Can Panorama takes special requests – add in the next step! A EUR1000 damage deposit is required on arrival (around USD1120.25). This deposit will be fully refunded at check-out, as long as there isn't any damage to the property. Please inform Can Panorama of your expected arrival time in advance. You can use the Special Requests box when booking, or contact the property directly using the contact details in your confirmation. A damage deposit of EUR 1000 is required on arrival. That's about 1120.25USD. This will be collected as a cash payment. You should be reimbursed on check-out. Your deposit will be refunded in full, in cash, subject to an inspection of the property. The third bedroom leads into the lounge and is separated by a sliding screen so privacy is an issue as noise travels. There is a fourth bedroom, but it is a little damp and dingy. Nonetheless, the property is advertised with 3 bedrooms so it's an added extra really. 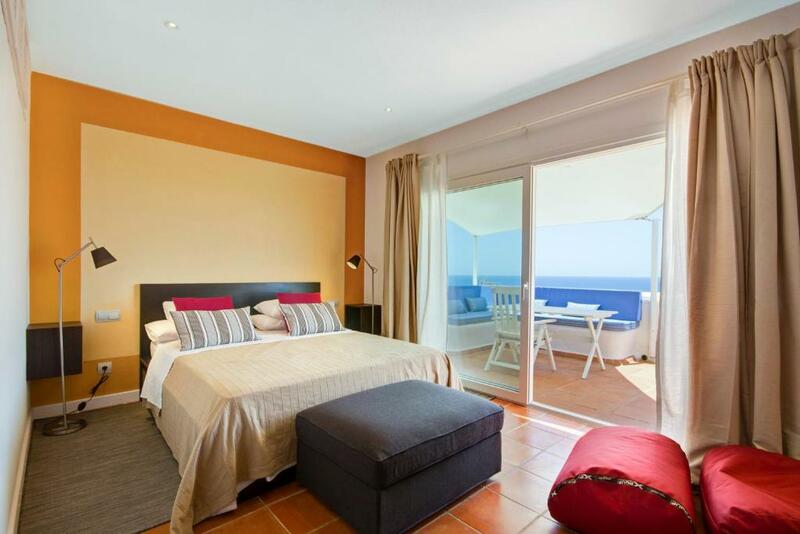 We loved the sea views, which can be enjoyed on each of the 3 terraces, two of which are accessed via 2 of the bedrooms. There is plenty of seating on each of the terraces. We really enjoyed having breakfast together on the ground floor terrace (which has a substantial table and super comfy chairs) overlooking the sea in the morning. All of the 3 bedrooms are light and airy. Each comes with good quality mattresses and linen. We all slept very comfortably indeed. The villa was well equipped. There was lots of cooking equipment, including new pots and pans as well as all the utensils you could need. There was even a selection of condiments and thinks like olive oil, honey and some seasoning were already provided. It was a pleasure to prepare food in the kitchen. There are also portable lie beds and towels that can be easily carried down to the pool. Erik was incredibly helpful. He gave us recommendations for restaurants, taxis and beaches. His communication was excellent and nothing was too much trouble. He was flexible about our check-in/check-out and was a pleasure to deal with from start to finish. The area was quiet but centrally located in close proximity to the main clubs, the beach and the old town. There is a driveway which was handy for our rental car. Location a little remote from shops, restaurants, bars etc but we had a car so not a big issue. Also whilst Ibiza generally can be quite expensive we found taxis to/from the property relatively cheap for a night out and easy to order. Charge for cleaning seems a bit excessive but at least we were made aware of this at time of booking. I did not like that the appartement was robed and we have lost 4 laptops apple, one ipad and 1800E in cash.... half a day lost at the police station. Of course the police did not find the stolen objects.... and the assurance don't cover us. There was nothing negative to be honest....but we did suggest to Erik that a larger coffee maker would be good as well as some oven gloves but other than that everything else was great. We spent 4 days at the villa to celebrate my husbands' 50th with friends. Erik is an excellent host and made arrangements so easy. He had thought of just about everything in the house and facilities were very good. There are lots of great kitchen things such as olive oil and washing up liquid which is very helpful. The views from the upstairs balconies are particularly gorgeous and we spent early evenings and mornings up there all together! The beds are very comfortable and a good selection of pillows to cater for different preferences. It was really good to have ensuite bathrooms for each bedroom too, as we travelled as a group of couples. Erik was so accomodating with us especially when we changed the group size. He was so helpful and offered lots of suggestions for places to go and restaurants etc. The pool was also really good and although this is shared by 3 other properties, no one else was there so we had it all to ourselves every day. All in all a great time had by all and we hope to return. Not much to dislike! No shops close by but that's fairly normal and taxis can find the address easily enough. For our group it would've been nice to have a private pool but there were only a few other people using it. The check in took a little longer than we wanted as were very tired but the owner was trying to be very helpful.